Yesterday I tried out the Bumbo with Bailey for a few minutes. I am so ready to be able to sit her in there on the counter while I am cooking or cleaning the kitchen. 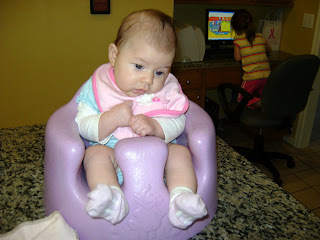 I hate having her on the floor in the bouncy seat, but this poor girl just is too young for the Bumbo yet. Her head kept getting away from her! She is doing ok on head control but her neck muscles need a little more exercising! OK let me just say I am not a fan of clothes with characters on them. I never have been and rarely will I put something with characters on it on my kids...however, this little Winnie the Pooh outfit used to be Avery's and it was a little chilly on Saturday in the house so I put this jacket on Bailey. The hood with the ears was so cute on her and my new living room rugs worked as a perfect background, don't you think? Ha! You can change your settings so that it doesn't allow "anonymous" comments. That way you won't get these really weird (and long) ads. How funny! Bailey is so cute. She's looking more and more like Avery!